For the next two weeks (December 17–December 31), Today in Energy will feature a selection of our favorite articles from 2018. New articles will resume on January 2, 2019.
International regulations limiting sulfur in fuels for ocean-going vessels, set to take effect in January 2020, have implications for vessel operators, refiners, and global oil markets. Stakeholders will respond to these regulations in different ways, increasing uncertainty for crude oil and petroleum product price formation in both the short and long term. When burned, the sulfur in marine fuel produces sulfur dioxide, a precursor to acid rain. The sulfur content of transportation fuels has been declining for many years because of increasingly stringent regulations implemented by individual countries or groups of countries. In the United States, federal and state regulations limit the amount of sulfur present in motor gasoline, diesel fuel, and heating oil. The upcoming 2020 rules apply across multiple countries’ jurisdictions to fuels used in the open ocean, representing the largest portion of the approximately 3.9 million barrel per day global marine fuel market, according to the International Energy Agency. The International Maritime Organization (IMO), the 171-member state United Nations agency that sets standards for shipping, is set to reduce the maximum amount of sulfur content (by percent weight) in marine fuels used on the open seas from 3.5% to 0.5% by 2020. These regulations are intended to reduce sulfur dioxide, nitrogen oxides, and other pollutants from global ship exhaust. The 2020 reduction in sulfur limits follows a series of similar reductions in marine fuel sulfur limits, such as those that reduced sulfur content of marine fuels in IMO-designated Emission Control Areas from 1.0% to 0.1% in 2015. 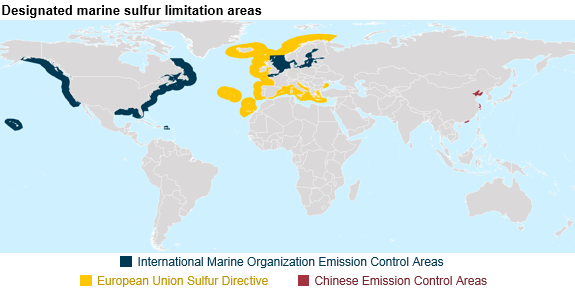 Other areas around ports in Europe and parts of China have adopted similar sulfur restrictions. Vessel operators have several choices for compliance with the new IMO sulfur limits. One option is to switch to a lower-sulfur fuel compliant with the new IMO rules. However, the cost, widespread availability, and specifications of a new fuel for use in marine engines is still uncertain. Another option is to use scrubbers to remove pollutants from ships’ exhaust, allowing them to continue to use higher-sulfur fuels. However, the process of installing scrubbers can be costly and can increase a ship’s operating costs. A small portion of existing marine vessels has already installed scrubbers, and that portion is not expected to increase greatly before 2020 because of time constraints and limited installation capacity. Even if scrubbers become widely adopted, which would allow the continued use of fuels with higher-sulfur content, the price and availability of higher-sulfur fuels after 2020 remains uncertain. Ships also have the option to switch to nonpetroleum-based fuels. Some newer ships and some currently being built have dual-fuel engines that would allow them to use nonpetroleum-based fuels such as liquefied natural gas (LNG) after minimal modifications. However, the infrastructure to support use of LNG as a shipping fuel is currently limited in both scale and availability. The upcoming IMO regulations pose a significant challenge for global petroleum refineries: how to increase the supply of low sulfur products for use in marine applications and minimize the output of high sulfur oils. Residual oil—the long-chain hydrocarbons remaining after lighter and shorter hydrocarbons such as gasoline and diesel have been separated from crude oil—currently makes up the largest component of marine fuels used by large ocean-going vessels, also known as bunker fuel. Removing sulfur from residual oils or upgrading them to more valuable lighter products such as diesel and gasoline can be an expensive and capital-intensive process. The choice of compliance path for vessels also introduces a risk to refiners: if scrubbers become widely adopted, higher-sulfur residual oils might still be used, potentially reducing the value of existing and new refining units capable of upgrading the residual oils. One approach refineries could pursue is to divert more low sulfur distillate fuel into the bunker fuel market, which would mean ocean-going ships would be competing with trucks, heavy equipment, trains, and planes for supplies of distillate fuels at a time when global demand for distillate is already high. To respond to added demand for distillate fuels, refineries can increase the rate they process crude oil or invest and build more refinery capacity to produce distillate fuels. Both options would increase demand for crude oil. Refineries might also choose to process crude oils that are lower in sulfur, yield a greater amount of distillates, and yield lower amounts of residual oils. Changes in the types of crude oil refineries purchase would then change how different crude oils are priced relative to each other and crude prices overall. The decisions refiners and shippers make in response to the IMO 2020 rules heavily influence one another, adding to uncertainty and complexity. In January 2019, EIA will release the first Short-Term Energy Outlook that includes monthly projections through December 2020. This report will discuss short-term implications and uncertainties surrounding the IMO regulations. Later that month, the Annual Energy Outlook 2019 will describe potential long-term implications of the regulations.